Digital cooking thermometer with external probe! (we like the one with the long wire so you can put the probe in the thigh of the turkey and close the oven door-watch as the external monitor shows the turkey coming up to temp without you having to move!!! 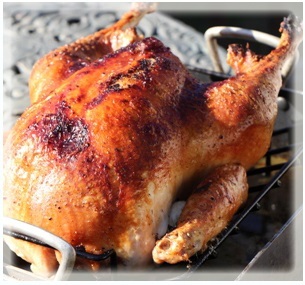 This succulent bird benefits from a massage with butter and frequent basting to ensure a crispy skin! Remove turkey from fridge about 60 minutes prior to roasting. Move oven rack into the lower third of the oven then preheat oven to 425 degrees. Make sure you have removed the innards from the turkey if there are any (sometimes the neck etc are placed in a plastic bag and put in the cavity of the chicken). Use your finger to gently separate the skin of the breast from the flesh of the breast- try not to tear! Gently rub about 4 tablespoons of butter under the skin of breasts-this will keep the breasts nice and juicy. Coat the turkey with oil and liberally season with salt and pepper. Add chicken stock or water to the roasting pan with the remaining butter. Place the rack in the pan and place the turkey on the rack. Place the bird, breast side up, in the preheated oven for about 45 minutes, reduce the temperature to 350 degrees and baste the turkey with the liquid in the pan. Baste turkey every 30 minutes and continue roasting the turkey until the skin is golden brown and the internal temperature of the bird is 155-160, about 2- 2 ½ hours longer. You can check the turkey’s internal temperature at the thickest part of the thigh closest to the body, but not touching the bone. We will want to remove the turkey before the temperature of the turkey reaches the safe temperature of 165 as the turkey will continue to cook once its out of the oven from carry over heat. The skin should be golden brown. If the skin it starts to become too dark and the bird is not done roasting, tent the breast with aluminum foil. Remove from the oven and let rest for at least 30-45 minutes covered with foil before carving. You should figure on about 1-1 ¼ pound of turkey for every person you are feeding. This will give you plenty of leftovers and satisfy the biggest of appetites! Make sure to strain and reserve the dripping for use in our Turkey Gravy!